Nominations for the 2019 Morsch Award are being accepted through Friday, May 17 at 5:00 pm. The award will be presented at our annual Pro Bono and Public Service Awards Luncheon on July 23, 2019. Each year, the CBF awards the Thomas H. Morsch Award, the premier public recognition for long-time legal aid and public interest law attorneys in our community. The Award, which includes a cash prize generously provided by the Morsch family, was established to recognize and reward exemplary lawyers who choose public service work as a career. The cash gift celebrates the Award recipients’ accomplishments and serves to honor the financial sacrifices they have made by choosing legal aid as their life’s work. 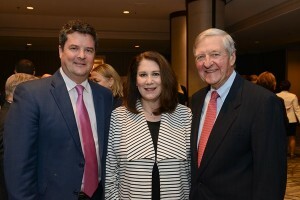 The Award is named after Thomas H. Morsch, a former partner at Sidley Austin, and a leader in the Chicago legal community who has championed the cause of public interest law for more than 40 years. Mr. Morsch headed Sidley Austin’s commercial litigation department from 1973-1995, was a member of the firm’s Executive Committee and supervised the firm’s Committee on Pro Bono and Public Interest Law for 20 years. Mr. Morsch was the first Director of the Small Business Opportunity Center at Northwestern University School of Law, now known as The Donald Pritzker Entrepreneurship Law Center. He is currently the Center’s Emeritus Director. Mr. Morsch has also served as president of The Chicago Bar Foundation and in leadership positions on the boards of numerous other charitable and legal organizations in the Chicago area.